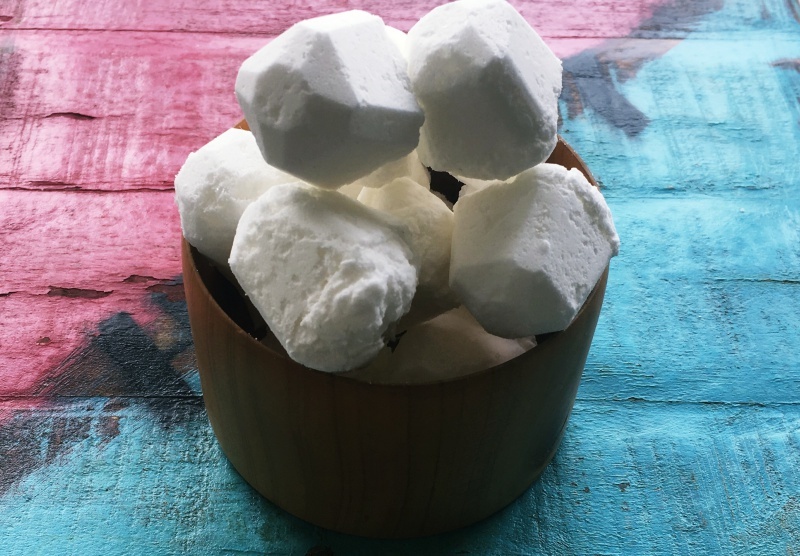 I’ve had a few emails and comments regarding my previous recipe for toilet bombs not working out very well; some people had trouble getting them to stay in the tray and form a cube, while others had cubes that stuck together once in the jar. I’ve revised the recipe to make it easier and more reliable. Click the button below for the new version. Toilet bombs are perfect to drop in the toilet for an instant freshen up. The citric acid creates a good fizz while dispersing the baking soda, Castile, and peppermint essential oil. Keep them in a sealed jar within reach so they’re very easy for anyone to use – just make sure you close the lid tightly or you’ll end up with a big blob. Mix the baking soda and citric acid together until combined then slowly add the Castile soap and peppermint essential oil, stir well until it resembles wet sand. Carefully but quickly squash the mixture into your ice cube trays and push down really well, leave to set in a dry place and check after 15 minutes, push back down if they are rising up. Then leave to set solid, this can take anywhere from half an hour to a couple of hours depending on the humidity. Once set hard carefully remove the bombs from the trays and place into a jar that has a very firm lid, to help keep them solid put a couple of silica gel sachets in the jar. Every time you use them seal the jar again, any air especially warm air, will make them form into a big blob. I keep mine in a jar near the toilet and so far they’ve stayed hard. To use place one bomb in the toilet bowl when it needs freshening up. Thanks for the cool recipe. Would it work with normal twist ice cube trays. Thanks!! Hi, yes I think it would as they set pretty solid so should lift out of the tray, if you twist the tray it may shatter them though. This is awesome! Thank you for sharing the recipe! Is it ok to substitute other liquid hand wash for the Castile soap? Not sure how this can work – it’s usually the seat, top of the toilet and under the rim that need cleaning. I’d say that you’d still need to wield the brush! Just wondering if these are any good for dissipating smells in the toilet room? I have one child who leaves a stink!! Hi! Is this the same recipe as the peppermint paste cleaner? I bought some but haven’t been using it (too lazy). Could i repurpose it for this? Hi Helen, mine did that also but after the 10 minutes they calmed down and I could squish them into the ice cube tray, although i did have to give them an extra push every now and then, you could try adding less citric acid, 1/4 instead of 1/2 should lessen the reaction. Did you use Wendyl’s baking soda or store bought? Ours is not man made (in China) where as a lot is, i’m wondering if that could make a difference. Hi Lee, Heat could make a difference if it’s unusually warm. Mine frothed up but after about 10 minutes they calmed down and I could squish them into the ice cube tray, although i did have to give them an extra push every now and then, they set no problem. You could try adding less citric acid, 1/4 instead of 1/2 should lessen the reaction. Did you use Wendyl’s baking soda or store bought? Ours is not man made (in China) where as a lot is, i’m wondering if that could make a difference. Do you sell the citric acid? Oh dear, sound like the moisture go to them, this happens to our dish wash powder on occasion. Next time try putting a silica gel sachet in the jar and keep the jar in a moisture/humidity free zone. To fix the issue now, get the giant bomb out of the jar, pop in a blender with a little castile soap until it frees up (if really hard you may need a little warm water) then put back into the moulds.